Ready to mix the Topping! Got Peaches? Got Craisins? Got Oats? If you have these ingredients just waiting in the wings - bake a delicious juicy colorful Peachy Craisin Crisp! This dessert is the perfect addition to the menu for this holiday weekend! Everyone will enjoy it! No need to roll out a pie crust, either! Ever since our local Peaches have been available, I've purchased them weekly. The sweet fruit is so good in a fruit salad. Some mighty tasty Peach Freezer Jam can be enjoyed all year, also- that is until your supply runs out! Every week we devour the ripened fruit & I purchase them again. Not this past week. I did buy them, but I had the sole intention to bake a Peachy Craisin Crisp! It was the perfect dessert for my DH's b'day! A cake can be baked any time of the year, but local fresh Peaches come only once a year here in New England! This is a family fave dessert! My 8" x 8" rose colored Pyrex baking dish was filled with Peach slices. About 1/4 cup Craisins were sprinkled on top & mixed in with the slices. After 45 minutes of baking it came out of the oven. Yum, yum, yum! To remove the Peach skins easily: With a spoon place Peach in simmering water (enough water to cover piece of fruit) for about 25 seconds. With spoon remove from water & cool until easy to handle. Peel fruit & cut into slices. In both my former & now my new oven the baking time is 45 Minutes. Spray glass baking dish with PAM. 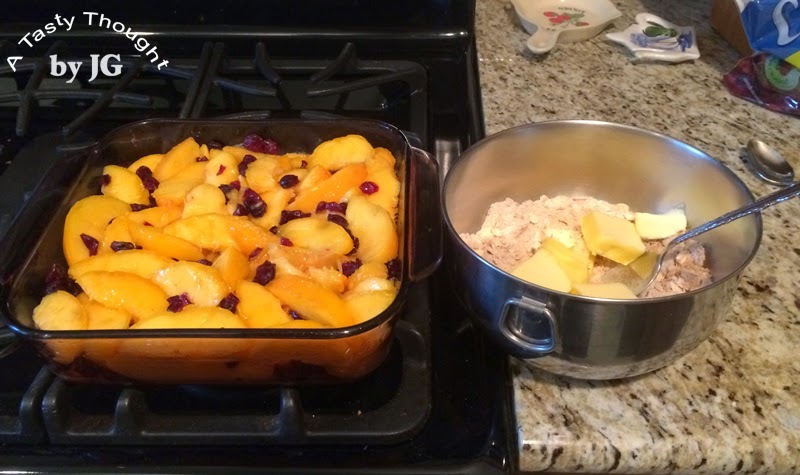 Place sliced Peaches in baking dish. Sprinkle on Craisins and mix. In small bowl combine all dry ingredients thoroughly. Add softened Butter or Margarine & combine thoroughly. 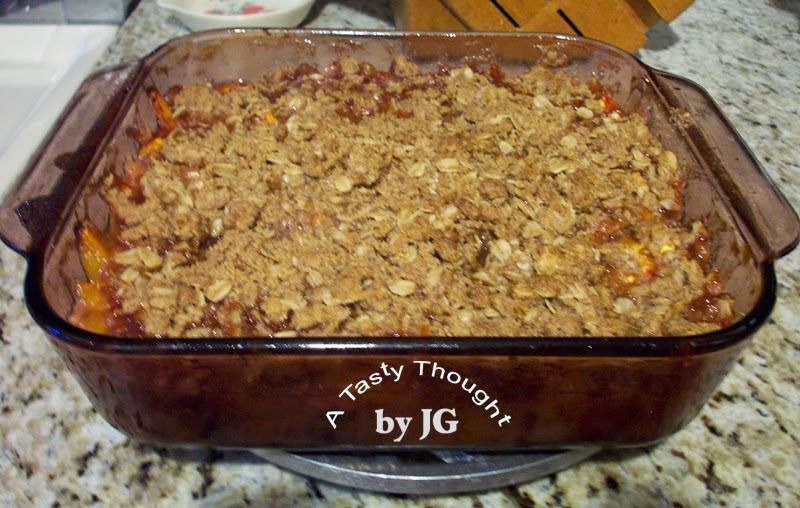 Sprinkle this Topping mixture evenly over Peaches/ Craisins. This is a very yummy dessert! During the summer months I don't roll out pie crusts & I do not like the taste of the commercially prepared crusts. 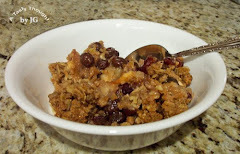 No pie crust needed here- this is a tasty treat! This past month whenever I have been outside during the daylight hours, a quick glance at one of our colorful gardens is always going on. 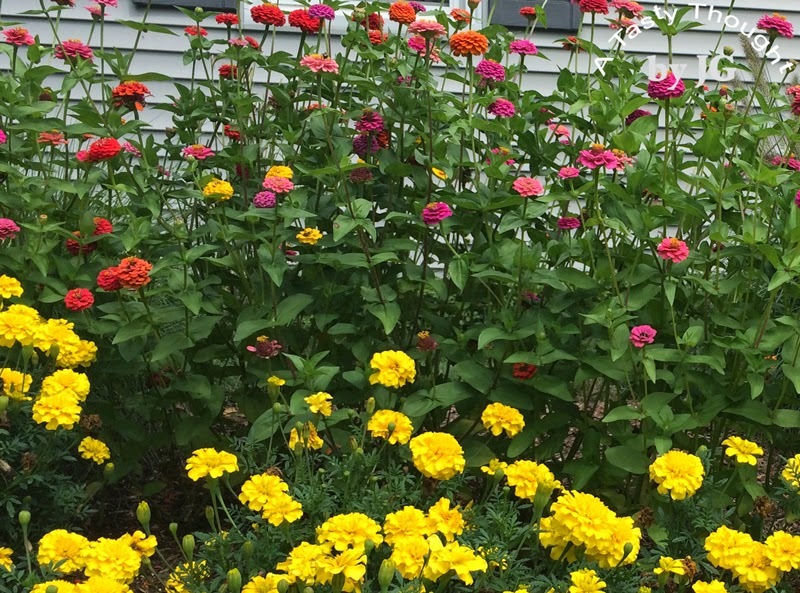 The vibrant Zinnias that we planted from seeds are constantly blossoming. 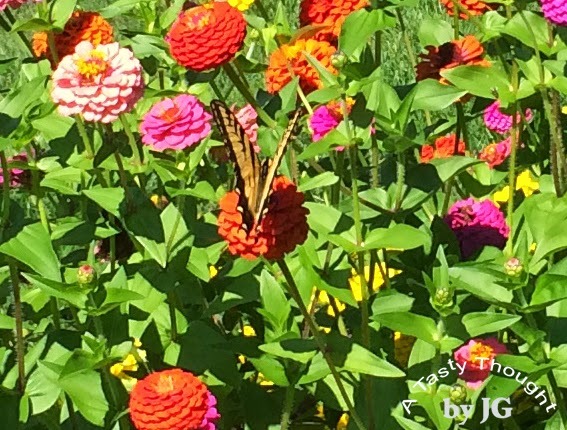 I've learned from past experience that there will be an opportunity to suddenly see a brightly colored butterfly gliding in to check out our Zinnias. Suddenly, today, it happened! Sure looked like an Eastern Tiger Swallowtail! Every year our guests return! Was it the Cumin? The Paprika? Or the Lime Juice that smelled so good when the cover to our outdoor grill was opened? This combo along with Garlic & Oregano resulted in a wonderful aroma floating through our Family Room screen! I knew I was hungry, but suddenly I was famished! Then, my DH turned the chicken that was grilling over to grill the other side. We totally loved the flavor while enjoying dinner that evening. No need to purchase any bottled marinade for this recipe. You have the marinade ingredients in your fridge & pantry! Two weekends ago we had a "Family Get-Together". So FuN & a family tradition! 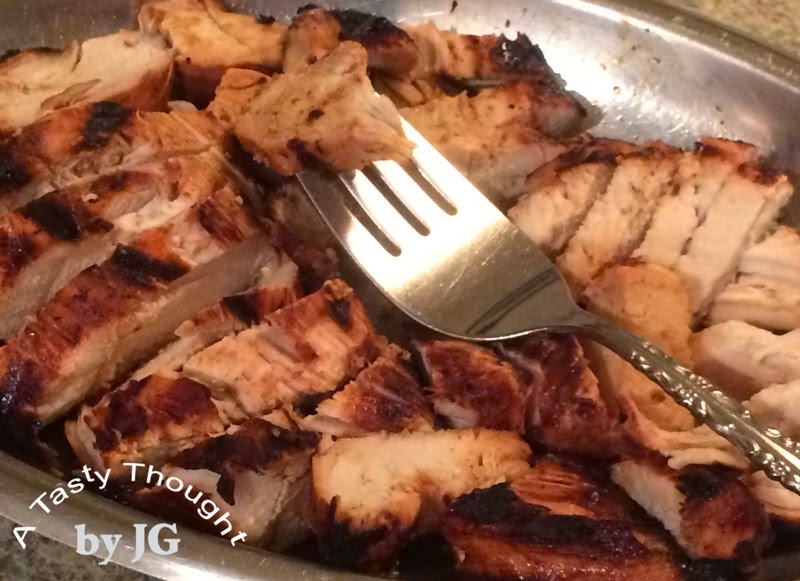 This entree was definitely on our menu- very tasty, very tender slices of marinaded chicken. Oh, it's outdoor grilling time! This recipe, "Peruvian Grilled Chicken", was one that I had literally ripped out of our local Springfield Republican back in 2007. The recipe had been reprinted from the Sept. 2007 issue of Gourmet Magazine. So glad I saved it! The chicken breasts are marinated 4- 8 hours or overnight in a great combo of ingredients! A gallon sized Ziploc Freezer bag works so well, here. If you enjoy the taste of tangy Lime Juice, Cumin & Paprika, you'll definitely like this marinated grilled chicken. Try it, you'll like it! Prepare marinade by combining ingredients in Gallon sized Ziploc Freezer Bag. Place closed Ziploc Bag in/ on a dish & refrigerate for 4 - 8 hours, or overnight. Remove Chicken from bag to drain. Do not save marinade. Grill Chicken. Our grill requires 12 Minutes each side of chicken. Grilling time depends on size/ thickness of Chicken & your grill. After grilling, place on clean platter. Let stand 5 minutes before cutting into slices. 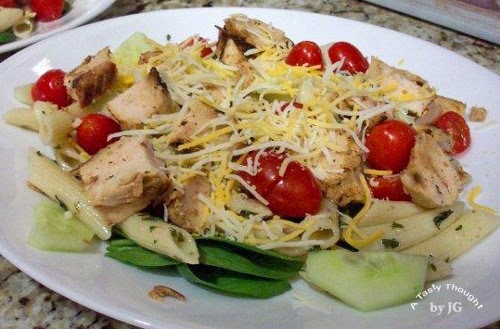 I like to grill 3 chicken Breasts & use the leftover slices in a cold salad platter for dinner the next evening. This is a "try it, you'll like it" recipe. For our "Family Get-Together", I prepared a triple batch - each marinading separately. There were no extra slices for any cold Salad Platters the next evening! The Lime Juice gives it an extra kick! As promised on all of our weather reports for today, it absolutely poured buckets of rain - for a very long time. Yesterday's views of our colorful flowers were a memory. This view will last until we do get our first strong frost. 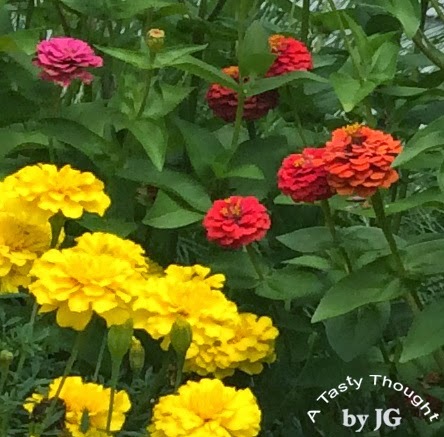 The Zinnias were planted from seed while small Marigold plants were placed in the soil. I probably will save the Zinnia seeds to dry & store to plant in next year's garden. Some of my favorite sights of Summer! This is the week - August 3- 9! Tom Vilsack, our U.S. Department of Agriculture Secretary, has declared this week National Farmers Market Week! If there is a Farmers Market near you, plan to stop in this week & purchase fresh fruits & vegetables that are available. This Thursday when I stop in to our local Farmers Market, Peaches will definitely be one of my purchases. They are locally grown. They are sweet & juicy. 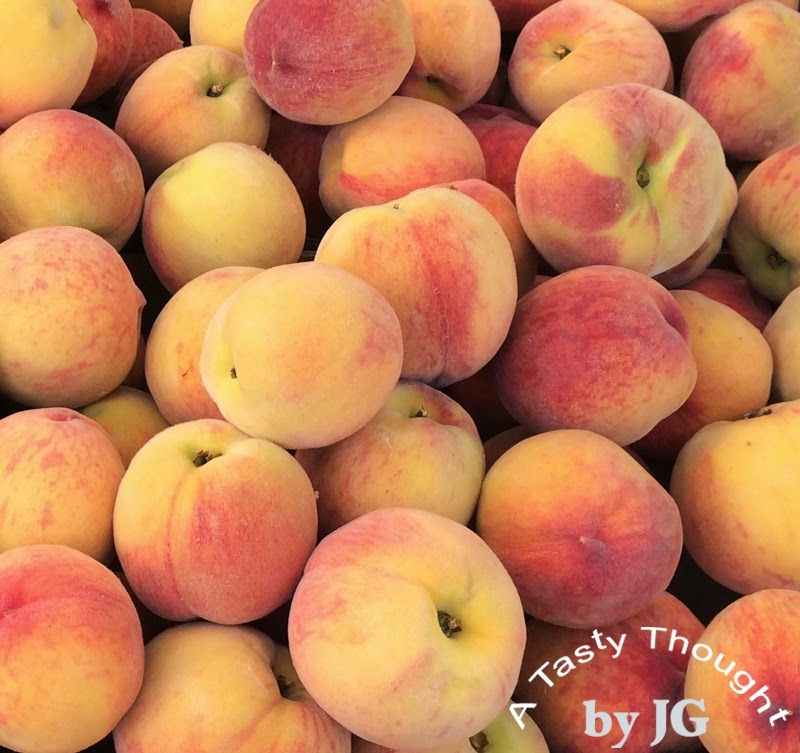 The local Peaches are a delicious snack & they also make very tasty Peach Freezer Jam! Peach Freezer Jam is the last variety that I make every summer. I have the Certo, Sugar, Lemon Juice & containers. For over 30 years I've prepared Freezer Jams, but every time I always reread the directions located in the Certo package along with own my helpful hints. Each batch is prepared separately. To remove Peach skin- place the Peach in simmering water for about 35 seconds. Remove, cool. Skin peels with no waste. Fresh Green Beans, Beets, Eggplants & Zucchini are also on my list when I stop in to our Farmers Market tomorrow! Locally grown fresh fruits & vegetables are so good! Next week stop in to a Farmers Market, again. It's a great habit! The photo says it all. 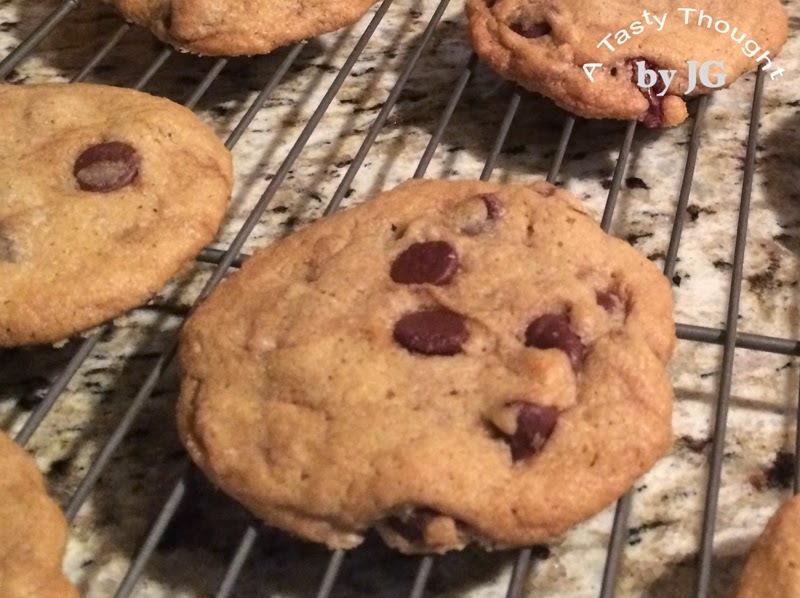 These soft, chewy Chocolate Chip Cookies will be a surprise for my fam! The recipe - Ruth Wakefield's Toll House Cookie Recipe - is located on the backside of the packages of Nestle Semi Sweet Chocolate Morsels. For more of the story visit my FuN Facts page above. Do you bake these occasionally?